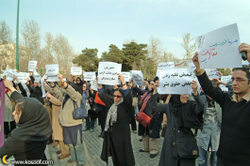 The peaceful gathering of women's rights activists, women's groups and human rights defenders who had gathered in Park Daneshjoo (Student Park) yesterday, in commemoration of March 8th, International Women's Day, ended in violence, when they were attacked and assaulted by plain clothes militia, special anti riot forces of the Revolutionary guards, soldiers and police. Approximately 1,000 women had gathered in Park Daneshjoo on the occasion of the International Women's Day to emphasize their stance in support of women's human rights and peace. The ceremony which started at 4:00 pm, and was scheduled to last one hour, was charged by security forces shortly after it began, who relentlessly beat the protesters, in an effort to disperse the group. 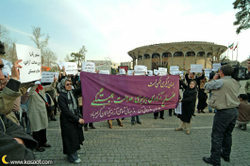 The sit-in, which was organized by independent women's groups and activists, was supposed to be carried out silently, with protesters holding signs reading some of the following statements and slogans: discrimination against women, is an abuse of their human rights; women demand their human rights; women oppose any form of forced aggression or war; Iranian women demand peace; injustice means discrimination against women, etc. Ten minutes into the protest, after security forces had managed to fully film and photograph the protesters for follow-up and interrogations at a later time, the women were asked to disperse, on the grounds that their assembly was illegal and did not have a permit. At this point, the protesters started singing the anthem of the women's movement, which again calls for changes in their human rights status. At 4:20 the final statement of the sit in was read, during which the security forces dumped cans of garbage on the heads of women who were seated in an effort to prevent easy dispersal. The security forces then charged the group and began beating the protesters. Even after the protesters had dispersed many were followed by the security forces and beaten. Some of the female protesters were beaten repeatedly with batons, and some male protesters were beaten severely by security forces who administered the beatings in teams. Ms. Simin Behbehani (left), feminist poet, who is elderly and has difficulty with her vision did not escape the wrath of the police either. She was beaten by a baton and then kicked repeatedly by security guards, amidst objection by women protesters. Female and male pedestrians passing by the protest also received beatings by the police. Journalists, including several foreign correspondents, who had filmed and photographed the event, were rounded up, held in custody and released only after their films and photographs had been confiscated. The security forces were estimated at over 100, with busloads being added during the course of the protest. All carried batons and the women were repeatedly told by the security forces as they administered beatings that they had orders to beat the protesters. While the Iranian constitutions allows for peaceful gatherings without permit, the government requests a permit for public gatherings. Women's rights groups have been repeatedly denied requests to hold public gatherings, and so they have chosen to exercise their rights of assembly in organizing peaceful gatherings without obtaining permits. Iranian women have in solidarity with their sisters internationally been publicly celebrating international women's day for several years. The pressure has increasingly grown on groups who which to commemorate this event. This latest development is part of a growing pressure on women's groups and women's rights activists as well as human rights defenders and civil society leaders in Iran. 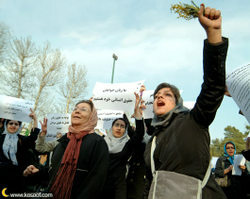 In June of 2005 thousands of women gathered in front of Tehran University asking for changes in the constitution with respect to women's rights. 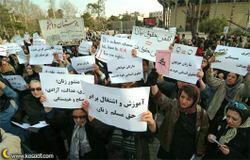 Many of the women involved in the protest were subsequently called in for questioning by security forces, interrogated, repeatedly harassed and some organizations were denied permits of operation due to their involvement in the Tehran university protest. Women's rights activists believe that interrogations, harassments, and pressure on their organizations, including closure and arrests will increase as a result of this latest event. We hope that the international community, especially women's groups and human rights organizations will stand in solidarity with Iranian women, to condemn this violent attack of women's rights defenders in Iran. We especially urge women's groups in the region and from Islamic countries to protest the violent actions of the security forces against women's rights activists and defenders. "EXPORTING HOMOPHOBIA" is the title of a just-published article on Alternet by Nicole Makris that analyzes how "the Bush administration is waging a quiet war on homosexuals abroad in the name of Christianity by pushing so-called 'Christian values.'" You can read it by clicking here. » FDA OKs Return Of MS Drug from the drug Tysabri. Hi. Great post. Thank you!